Gluten Free Maple Pecan Pumpkin Muffins (V, GF): an easy recipe for deliciously moist, pumpkin spice muffins topped with maple glazed pecans. Vegan, Gluten Free, Dairy-Free, Healthy, Refined Sugar-Free. First there was chocolate pumpkin bread, then an apple crisp, then coconut chips, and then… wait for it… more pumpkin!! 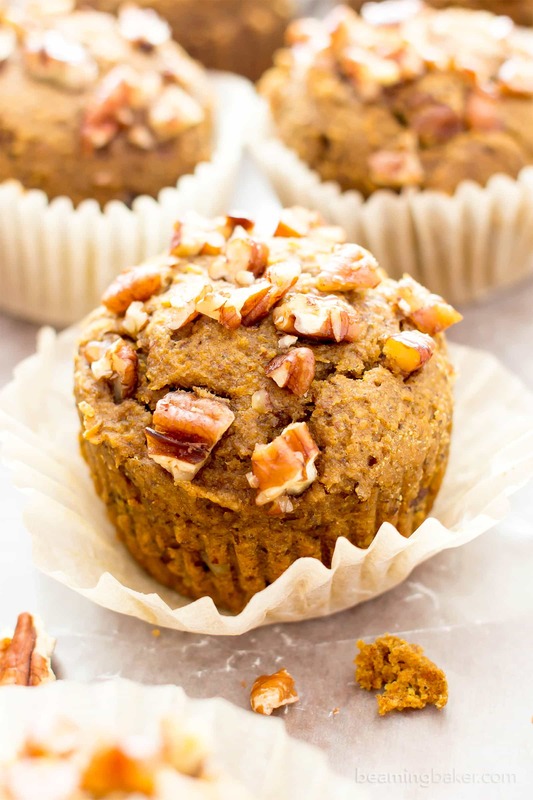 Make that Gluten Free Maple Pecan Pumpkin Muffins! Last year, I shared these skillet-roasted maple pecans. I loved the recipe, but didn’t think folks would get that excited about it. But, ya did. Like, really did. 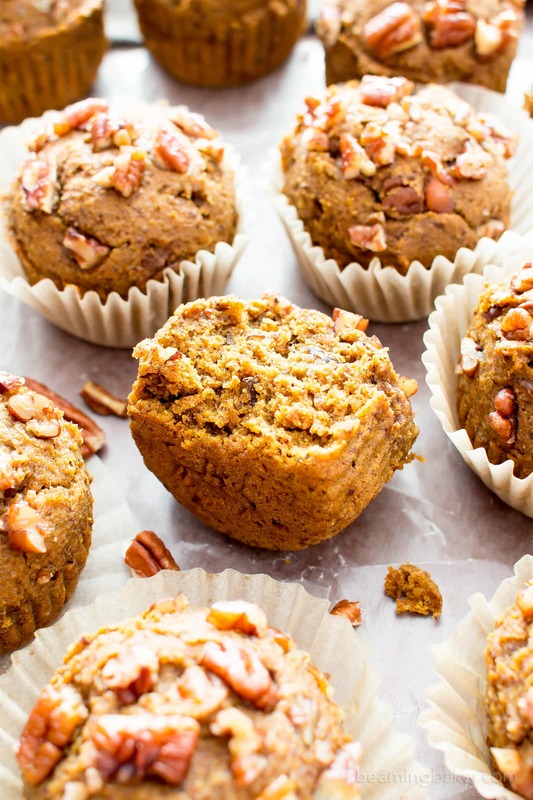 Once you bite into one of these muffins, you’ll instantly be transported into fall (nevermind that it’s almost fall… oh, you know what I mean!). All of the things you’ve been dreaming about all year long: the cozy aroma of ground cinnamon, the uniquely bright and cheerful color of pumpkin, fresh-baked goods coming straight out of the deliciously warm oven, and the cartoon-perfect swirls of steam coming off your perfectly domed-topped muffins. They’re here. It’s time to finally break out the pecans, dust off your poorly neglected muffin pans, and warm up the oven. 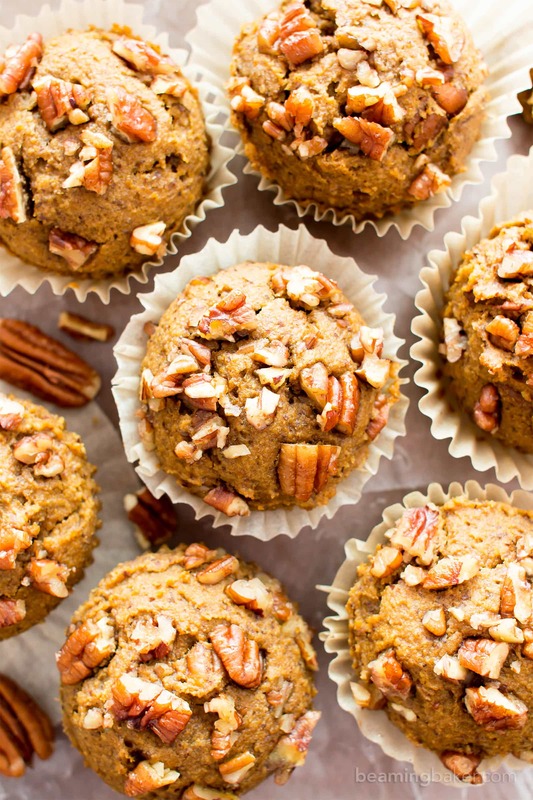 These refined sugar-free (woot woot), gluten free Maple Pecan Pumpkin Muffins are my mom’s new favorite/oft-requested treat. Now that I’m living so close to her, it’s very easy to drop off my latest creations. So now that we all officially have my mom’s approval on record, we may proceed! 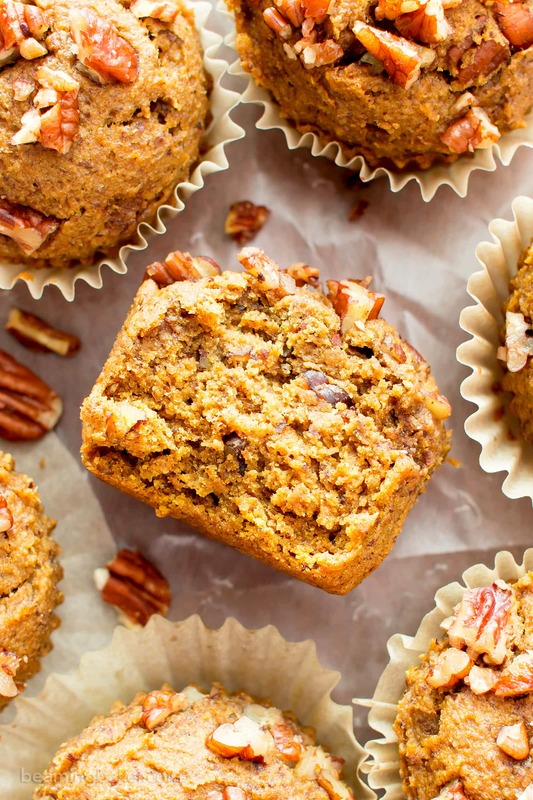 These Gluten Free Maple Pecan Pumpkin Muffins are basically baked goods full of fall fun/awesomeness/yum/…quick-someone-get-me-a-thesaurus! Jazz hands! The maple glazed topping is sooooo easy to make, and of course, made with the least amount of sugar I could possibly manage. Remember to use a large cookie scoop to scoop and drop the muffin batter for a nice rounded top. As I’ve mentioned before, my all-time favorite scoop to use is this ice cream scoop. I know, it’s kind of funny, but the darn thing works SO well. It’s how I got the perfectly domed tops that you see in the photo here. Once those muffins are safely and snugly sitting in their muffin cups, it’s time to prep the pecans! All you have to do is add the pecans and maple syrup to a small bowl, fold and stir until coated, and voila! It’s time to sprinkle those bad boys onto the muffin tops. 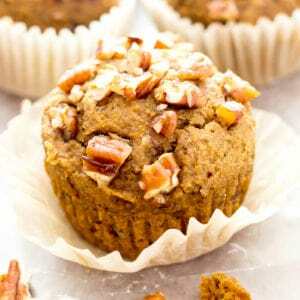 The result is so incredibly delicious and amazing: moist pumpkin muffins bursting with warm spices and pecans, then topped with glazed maple pecans. When you take that first bite, you’ll be amazed at the pop of maple flavor. It’s splendid. totally FIVE STAR rated by my mom, like woah! What are your happiest fall memories? 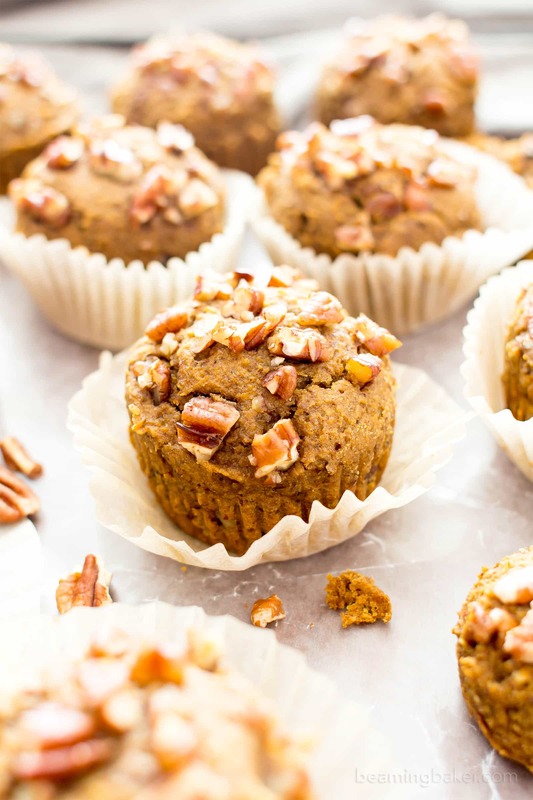 Gluten Free Maple Pecan Pumpkin Muffins (V, GF): an easy recipe for deliciously moist, pumpkin spice muffins topped with maple glazed pecans. Vegan, Gluten-Free, Dairy-Free, Healthy, Refined Sugar-Free. Preheat the oven to 350°F. Place cupcake liners in a standard, 12-muffin pan. Set aside. Add the dry ingredients: oat flour, almond meal, baking powder, baking soda, spice and salt. Whisk together until just incorporated, making sure no flour patches remain. If needed, use a rubber spatula to fold in the last bit of flour. Fold in ¾ cup pecans. Using a large scoop, scoop and drop batter evenly into the muffin pan. If needed, use a rubber spatula to smooth batter into an even layer with a domed top. In a small bowl, add Topping ingredients: ¼ cup pecans and 1 teaspoon maple syrup. Stir and fold until pecans are well-coated in maple syrup. Evenly sprinkle maple pecans over muffins. Gently press into muffin tops. Bake for 18-25 minutes. Mine took 20 minutes. Allow to cool on a cooling rack for 1 hour, or until completely cool. Enjoy! Storing instructions below. - Adapted from my One Bowl Gluten Free Pumpkin Bread and my Pumpkin Chocolate Chip Muffins. - *Instead of pumpkin pie spice, you can use: 1 teaspoon ground cinnamon, ½ teaspoon ground cloves, and ½ teaspoon ground nutmeg. - Storage notes: Cool completely, then store in an airtight container for up to 1 week. - To freeze: store in an airtight container in the freezer for up to 1 month. Allow to thaw at room temperature for 10-20 minutes, or heat in the microwave in 15-second increments until warm. 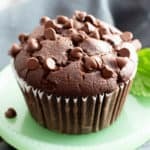 - More V+GF muffin recipes: double chocolate banana muffins, mini chocolate muffins, banana nut muffins. Can you please tell me, is this recipe using commercially canned pumpkin? My homemade pumpkin puree is usually thinner (more like applesauce), so I should adjust it if that is the case. This recipe sounds SO YUMMY! Thanks! Thanks so much, Marsha! 🙂 Pumpkin is sooo tasty all year-round! Can you replace almond flour with anything else?? Thanks!! I will let you know if I make it with these substitutions! Hi! Is there another type of flour you think I could use instead of oat flour to make these muffins Paleo? Like possibly coconut or almond flour?? 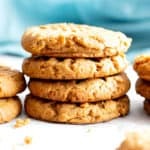 Hi Sami, unfortunately, coconut flour and almond flour have very different absorbency levels than oat flour (which completely affect the end results). I’m afraid there’s no easy/quick way to sub them. Sorry about that! Maybe sub buckwheat flour? I’m allergic to oats & try to use that as a substitution whenever I can. LOVE how pumpkin keeps muffins so moist and delicious. These look ab-fab! Can you sub the coconut sugar for brown sugar or organic cane sugar? Will it change the texture much? Hi Cailey, you should be able to use brown sugar with similar results. 🙂 Can’t wait to hear how these turn out! These were AMAZING! I made a double batch and put mini chocolate chips in half for my kiddos and then the pecans in the other half. Both were so yummy! How many Eggs does this call for instead of doing flax egg ?? Thanks !! I am wondering if I can substitute date sugar for coconut sugar and avocado oil for coconut oil? These look amazing! Hi Kim, hmm… good question. I’ve never tried using either of those subs in this recipe, but they sound like they might work. Let me know how they turn out if you try it! 🙂 Happy baking! Hi… My husband is allergic to flax seeds and almonds… so what would you substitute for them? Hi Isabel, you can substitute the ground flax with ground chia seeds. 🙂 Make the chia “egg” just as you’d make the flax egg. As for substituting the almond meal, here’s what I said to another reader about that: “you can try subbing the almond meal with: 1) 1/4 cup + 2 tablespoons oat flour, OR, 2) 1/2 cup sunflower meal (sunflower seeds ground to a meal). You might need to adjust the amounts to get just the right texture!” Hope this helps. Let me know how it turns out for you! 🙂 P.S. Cashew meal might work too! Hi, I’ll be making these muffins tomorrow…they look divine ! 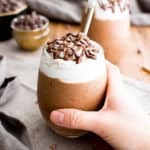 Is there a way to print your recipe ? Maybe I’m missing it. I just didn’t see where to print…thank you ! I made the muffins today and omg, they are fabulous and my husband loves them too ! Can’t wait to try more of your gf, vegan recipes. Wow ! These are perfect ! These muffins are fantastic, thanks for sharing this recipe!! I’m so glad you enjoyed them, Julie! 🙂 Thanks for letting me know! 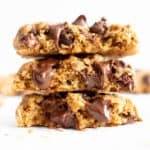 I was wondering if I could sub out the flax egg for egg replacer, in this recipe, and any of your other delicious recipes? Hi Melissa, great question! Yes, I think that would work just fine in most of my recipes (except for ones calling for a “modified flax egg”). I’ve had a few readers try egg replacer with good results. Can’t wait to hear what you try! Wow, these look absolutely insane. And I mean that in the absolute best way possible. Definitely need to try! Hi! I made these as written and they are to die for! Somehow my batter made more than 12 muffins so I put the extra in a mini loaf pan. Maybe I didn’t fill the muffin cups enough (need to get that scoop!). These are wonderful in taste and texture and the points I earned with my vegan son didn’t hurt, either, lol. Thank-you, Demeter, for the recipe. Hi Cindy! It’s fantastic to hear that you enjoyed these so much. 🙂 Batter: yeah, I definitely wanted these muffins to be nice and big! I’m always here & happy to help you score points with your vegan son. 😉 Thanks for taking the time to let me know. Hugs! Hi! These look amazing. 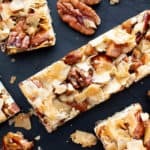 I want to make them for Thanksgiving, but my father in law is allergic to pecans. Strangely, he’s ok with almonds but not with pecans. 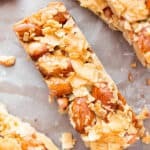 Can I leave out the pecans, or should I substitute them with almonds? I appreciate the recipes you post and have tried several of them. I notice you use oat flour in numerous recipes. 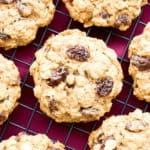 Is there a substitute for oat flour? All wheat flours are out for me and so is oat. Thank you! Hi Lori! Thank you for the kind words. You can try substituting the oat flour for a GF 1:1 blend using the same quantities. I’ve had other readers do this on various recipes with good results. Happy baking! I’m SO happy to hear that you love these, Deborah. 🙂 My main goal with this recipe was to get that domed top (with a little help from an ice cream scoop). 😉 Can’t wait to hear what you try next. Enjoy! Hi there…I can’t wait to try these. I have more of a curious question I guess. Is there a way to make this recipe into a loaf? Any thoughts on how long I would need to cook it? I plan on doing the cupcakes, but I was thinking your recipe would be wonderful as a cake or loaf as well. Thank you either way! And thank you for all your creative juices! Life is good with you in it! Hi Blue Dawn (what a pretty name)! Use the recipe for my Gluten Free Vegan Pumpkin Bread. 🙂 Thank you for your kind words!! Hugs! How big is your can of pumpkin puree? Hi Tracy! I use 15 oz cans of pure pumpkin purée. Hope this helps! These are terrific and are what I take to family and church dinners. Last week I made these for our Pastor who can’t have white sugar or white flour – he raved about them! I am so grateful for your efforts and recipes because I haven’t only made them for vegans and gluten-sensitive loved ones, but they have also helped hubs and me eat healthier, thank-you! Woohoo!!! I’m so happy to hear that these are such a big hit! 🙂 I am truly so grateful to you, Cindy, for taking the time to try my recipes and to leave such wonderful feedback. Here’s to many more heathy treats that’s truly satisfy!